The temptation to treat faith a "a private matter" is especially strong and pervasive in the American church, as we are a society built on rugged individualism and personal responsibility. There is much to be said for those qualities, but they are certainly not the principle upon which God has built His church. The lone-wolf Christian is a clearly unbiblical concept and a total loser as a strategy. Spiritual isolation is a sinful and self-destructive habit and robs the church of the strength and agility God specifically designed for it. This is why the pinky finger in this five-part illustration represents the people of God. God's people in the land of Judah had languished for decades, neglecting and rebelling against God's commands. Yet we find that reform and renewal remained possible with faithful leadership and the wholesale devotion of His people. We see leaders, administrators, skilled craftsmen and strong laborers all working together and with a unity of purpose. Some accepted jobs outside their most obvious gifts (such as the musicians working as supervisors), because this was the work in front of them and it needed to be done. We see money contributed and brought in from across the land ... money that God entrusted to the stewardship of individuals, expecting that they would be open-handed when the time came that He would require it. This is God's people coming together under the faithful King Josiah and finding God's strength in God's community. Don't read anything into the relative size of this final digit! Ever try getting a strong grip without a pinky? Rather, all the other elements of the Christian life interact with this crucial one. God's Spirit is promised and present when "two or three gather" in God's name. The Word of God is preached and taught by those He has gifted for that service. 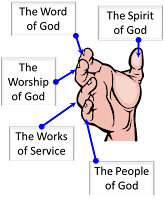 Worship is clearly set forth as a primary objective for the church's gatherings. Our labors for God are performed largely with and for God's people. What's more, King Josiah recognized the urgency of coming together, for disaster lay at Judah's doorstep. The days were treacherous. The erstwhile Kingdom of Israel to the north had long since fallen to foreign invaders due to its own rebellion, and Judah was sliding into the same pit. The need to assemble, rededicate, and labor on God's behalf was clear. The enemy we face is not a foreign king outside the walls, but Satan ... a roaring lion who hates God's people and seeks our piecemeal destruction. He has at his disposal an ally, planted on the inside, called "sin's deceitfulness". Neither the stranded sheep nor the lone wolves are safe from his wicked schemes, and if he can encourage more fools to isolate themselves and peel off, so much the worse for them and for the weakened body! The tools he uses today are his familiar lies and half-truths: "The church is irrelevant and full of hypocrites"; "Religion is a private matter"; "I'm too busy"; "I'm not being 'fed'" ... you've heard them before. You've probably fallen into a few of them yourself! I know I have. They all amount to weak excuses for sin. God's command could not be clearer. He express intent and command is for us to live as one body. We are vitally connected--encouraging and spurring one another on toward love and good deeds ... daily! Dear Christian, may you continue to strengthen your grip through wholehearted reliance on God's Holy Spirit; faithful instruction in His Word; sincere, reverent and regular worship; diligence in the works He has assigned you; and loving encouragement from His people ... and all the more as you see the Day approaching.